1. Bring 2 cups water and salt to a boil then add steel cut oats. Reduce heat to a low simmer. Cover and cook, stirring occasionally, 15 – 20 minutes, depending on how chewy you like your cereal. Stir occasionally. Remove from heat and let stand covered for a couple of minutes before mixing. 2. Meanwhile, make the cranberry sauce. Combine cranberries, water, syrup, and orange juice in a medium-sized saucepan over low heat. 3. Bring to a gentle simmer and cook until cranberries have softened completely and liquid is bright red, approximately 10 minutes. 4. 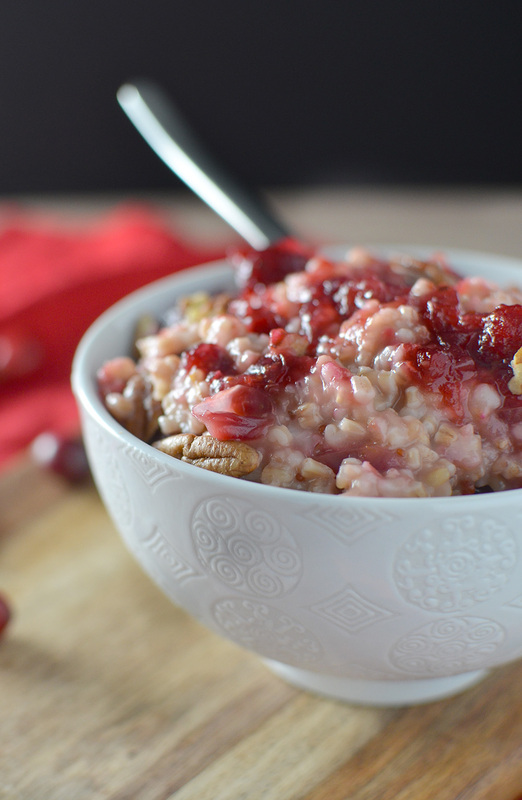 Mix ½ of the cranberry sauce into the cooked oatmeal and stir until incorporated, adding more syrup if desired. 5. Divide oatmeal among 4 bowls and top with remaining cranberry sauce, pecans and orange zest.